Squat Palla Growlers are a fun take on a classic concept. These 'pot-bellied' growlers with a pistol grip finger hold will make any beer stand out. Bring your next homebrew to a party in style with a Palla Growler! 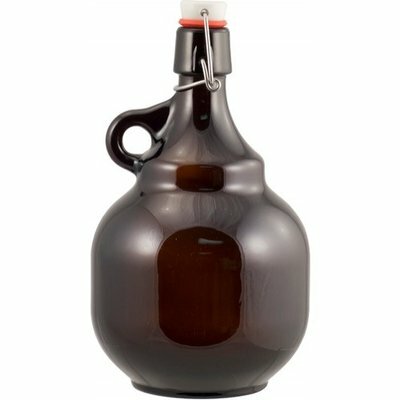 Palla Growlers offer a unique take on the classic growler concept. Short and squat with a round middle and narrow top, these containers are sure to catch some attention. First made famous by breweries like Russian River, these growlers are becoming more and more available. Holds 2 liters or ~ 1/2 gallon of your favorite beverage!